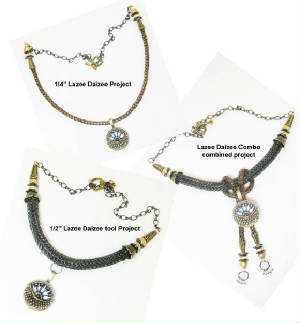 Jewelry Creation using Lazee Daizee. There’s a challenge for 2013. Earlier this week, inventor of the Lazee Daizee, Stephanie Eddy, contacted me to inform me that she has a challenge for 2013. Several years ago, you were very kind to review and recommend my Lazee Daizee wire weaving tool for Viking Knit. Since that time I have come out with a 1/2″ version of the tool as well as a “Lazee Daizee Guide to Viking Knit” book and expect to publish a project book on Viking Knit and other wire projects later this year. I see that you are in the middle of an afghan Challenge project this summer. I am emailing you to let you know that I am sponsoring a Lazee Daizee Challenge this year. The top prize is $500. There are 5 categories. The deadline is Dec. 31, 2013. The Challenge is open to anyone 16 or older. They can create jewelry or other wearable art as long as it involves a large percentage of Viking Knit in the final design using one or both of the Lazee Daizee tools. But they can also incorporate any other art form in to the design such as knitting or crocheting, etc. There is a Challenge kit that has a variety of findings and elements for use in their project but they only have to use the Art Deco glass button. The kit is available to anyone regardless if they want to enter the Challenge or not. My great-grandmother taught me to crochet while we sat in her rock chair when I was 5 or 6. I would love to see some entries with crochet, knitting or other weaves incorporated into Viking Knit. I’ve been experimenting a little with chainmaille, freeform Viking Knit and crocheting bead laced wire on to a Viking Knit base so I thought you may have an audience that would be intrigued. There is additional information on my web site StephanieEddy.com and I would be happy to mail you details and a Challenge kit if that would be appropriate. I did review her Viking Knitting Tool and showed how to use it several years ago on YouTube. You can see a musical preview of what it can do. This also a lesson on how to Viking Knit. Stephanie has an additional new tool that is bigger. That’s what this challenge is all about. If you are interested in this type of jewelry making, this may be a fun challenge for you. See Stephanie’s Website for more details about this challenge. This entry was posted in Announcements, Crochet Challenges and tagged 2013, Challenge, crochet crowd, Giveaway, Lazee Daizee, Lazee Daizee Challenge, Mikey, Prize, Viking Knit. Bookmark the permalink.